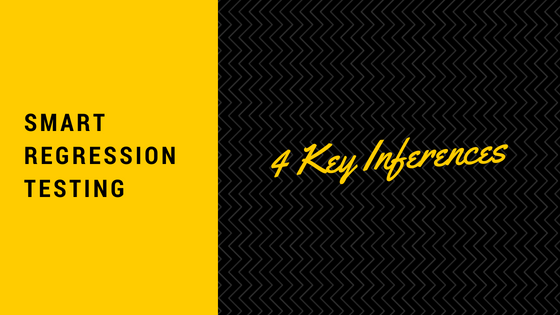 FOUR key inferences from regression test survey - Clean Software. Guaranteed. We did a quick survey on regression testing as a runup to our webinar “Is regression hindering your progression” consisting of FOUR questions listed below. 1.What fraction of total testing effort does regression tests consume ? 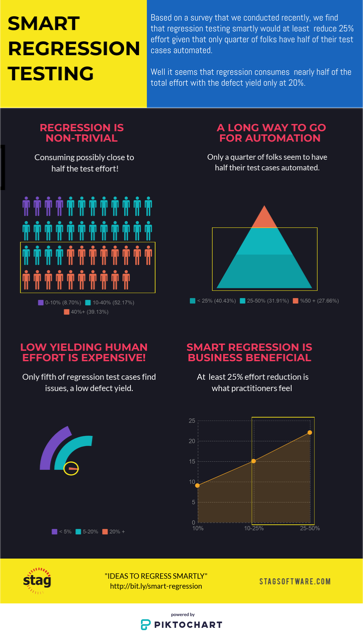 2.What fraction of regression test cases are automated? Regression is non-trivial, consuming possibly close to half the test effort. A long way to go for automation, only a quarter of folks seem to have half their test cases automated. Low yielding human effort is expensive, only fifth of regression test cases find issues, a low defect yield. Smart regression is business beneficial, at least 25% effort reduction is what practitioners feel. Here it is, as an interesting infographic. What do you think? How may $$/time will you save with 25% reduction?